Brick hard ground conditions due to exceptionally dry weather failed to stop annual renovation of Windsor Racecourse after the Saltex trade show. 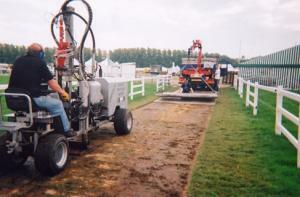 Having aerated the area by the finishing line and where the one mile start feeds the horses across the main track earlier this year, Terrain Aeration employed the company’s Airforce Terralift machine injecting compressed air one metre below the surface via a steel probe, to break up compaction caused by heavy goods vehicles during build-up and break down before and after Saltex, and pedestrian traffic during the show. “Careful pressure selection and the unique Terralift pressure control and injection system ensure that the ground remains true and there are no cavities into which an unfortunate horse can plunge a hoof,” David Green explains.